A cancer research specialist who sabotaged companies linked to animal research lab Huntingdon Life Sciences has been jailed for three years. Joseph Harris, 26, a doctor of molecular biology, has become the first person to be convicted under economic sabotage laws to protect companies. 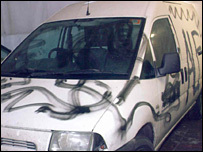 As part of his campaign Harris, of Bursledon, Southampton, glued locks and slashed tyres at three companies. Northampton Crown Court heard his work had put him in a "moral dilemma". He carried out the first attack on the day he was awarded his PhD. The court was told his field of speciality was leading him to test on animals as he researched treatment for pancreatic cancer. In sentencing him, Judge Ian Alexander said: "I am sorry that your conviction and the sentence I impose will seriously damage what was a very promising career. "It may well be that your future inability to continue your research into gastro-intestinal cancer will be a great loss to those who suffer that disease. "The seriousness and objective of your offences must be marked both as a punishment and deterrent to others." The judge added: "It causes me great discomfort in seeing you before the court having thrown so much away." 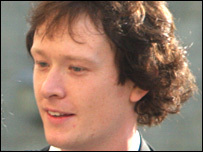 Harris attacked three companies linked to Huntingdon in December 2005 and January 2006. He admitted charges under the Serious and Organised Crime Act involving attacks at firms in Northampton, Nottingham and Bicester. The companies supplied building materials, refrigeration servicing and testing equipment to the Cambridgeshire firm. The court heard how the Nottingham University graduate had recently split up from his girlfriend, who disagreed with his work and its animal testing. Rebecca Trowler, who was defending Harris, said: "This put him in an increasing moral dilemma. "Essentially he came to a crisis point and he took a very very stupid decision." The Serious and Organised Crime Act was brought in by the government last July to tackle harassment and threats from animal rights activists. Vernon Coaker, Home Office minister, welcomed Harris' conviction. He said: "It is wholly unacceptable that a small minority of animal extremists should mount a campaign of fear and intimidation against individuals and companies going about their lawful business and that is why this Government took steps to introduce these tough new measures." How much animal testing is done?